I love the strong spicy flavors you find this time of year. 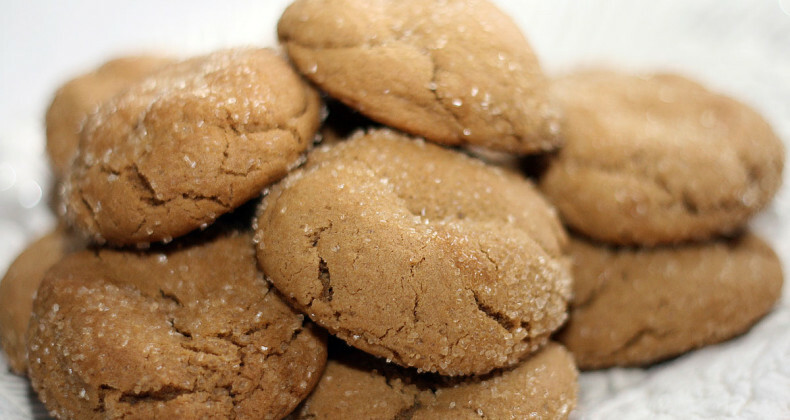 These ginger cookies are chock full of the wonderful spicy combination of ginger, molasses, cloves, and cinnamon. Before baking, I rolled them in turbano sugar which gives these soft cookies a nice crunch. If you don’t want to spend a lot of time in the kitchen baking cookies you should give these a try. The mix up in just a couple minutes and bake for 10 minutes. In your mixing bowl beat butter on high for 30 seconds. Add 1 cup sugar, soda, and spices. Mix until combined, scrapping sides as needed. Beat in egg and molasses until combined. Turn mixer down to medium and mix in flour. Shape dough into 1-1 1/2 inch balls. Roll in the coarse sugar. Place dough balls on parchment lined cookie sheet about 2-2 1/2 inches apart. Bake for 10 minutes. Cookies will be puffy when you remove them from the oven. Let cool on cookie sheet for 2 minutes before placing on a wire rack to cool completely.